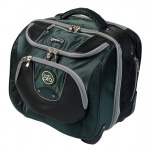 The Aero Ultraglide CX is the most popular bag in the Aero range. Designed to meet bowlers needs. Made with a strong moulded, lightweight base and from 800 denier rip-stop water and tear resistant fabric. Comes with double wheels for stability and strong pull handles for ease of use. Supplied with two two bowl carriers as standard.